Rejoice, for Lent is OVER!! I can now eat all the sweets I want! Chocolate and ice cream and the box of Samoas I stashed in the garage freezer 40 days ago, oh my! And now I have a MASSIVE sugar hangover. To be fair, I wasn’t quite as strict this year as I have been in previous years and slipped up occasionally. Sometimes a girl just needs a milkshake on a Friday afternoon when she was traipsing around New York City with out-of-town coworkers until 4:30am the previous night. Can you blame her? Usually, I want to break Lent with chocolate — I made an Almond Joy cake for Easter last year and chocolate tiramisu the year before. This year, I made good on my word and ate an entire bag of Reece’s Peanut Butter Eggs before 9am on Easter morning and then proceeded to tackle these cinnamon rolls. Molls is right, these rolls dessert AND breakfast wrapped up in a sweet ball of dough — it’s the best of both worlds! These rolls take a certain amount of patience to see all the way through because they’re a bit time consuming, but they’re definitely worth it! In a large bowl, combine yeast, 1/2 teaspoon sugar, and 1/4 cup warm water. Stir to incorporate and let stand until foamy, about 5 minutes. Add the rest of the sugar to the bowl, along with the milk, brown sugar, vanilla, egg, and egg yolk. Mix with a whisk until ingredients are combined, then add flour and salt. Using your hands, knead the dough until all ingredients just come together to form a dough. Add the butter and proceed to knead the dough — it will be come wet and sticky. Transfer dough to a well-floured work surface and knead about 1/3 cup flour into the dough. When dough is mostly smooth (a bit sticky is alright), transfer to a large, greased bowl. Place a damp towel over the bowl and put in a warm place to rise until doubled in size, about 2 hours. While you wait ever so patiently for the dough to rise, make the filling! Combine sugar, brown sugar, pecans, cinnamon, salt, nutmeg, and maple syrup in a large bowl. Set aside. Grease a 13-inch baking dish and set aside. When dough has risen, plop dough onto a heavily floured work surface. Add flour one tablespoon at a time until dough is no longer sticky. Place a damp towel over the dough and let rest for 5 minutes. Using a floured rolling pin, roll dough into a 10 x 10-inch square. Brush the top of the dough with melted butter and pour filling on top of the dough, leaving a 1-inch border on the sides. Lightly press filling into the dough. Lift the edge of the dough closest to you and roll into a tight cylinder. Place roll seam side down and slice into 8 or 10 equal rounds. Place rounds in the greased baking dish, cut side up. Cover with a damp towel and refrigerate overnight. The next morning, preheat the oven to 375 degrees F. Take rolls out of the fridge, uncover, and let them sit at room temperature for 15 minutes. Bake until golden brown and sugar is bubbling, about 30 minutes. While rolls are baking, whisk together powdered sugar and buttermilk until mixture is smooth. 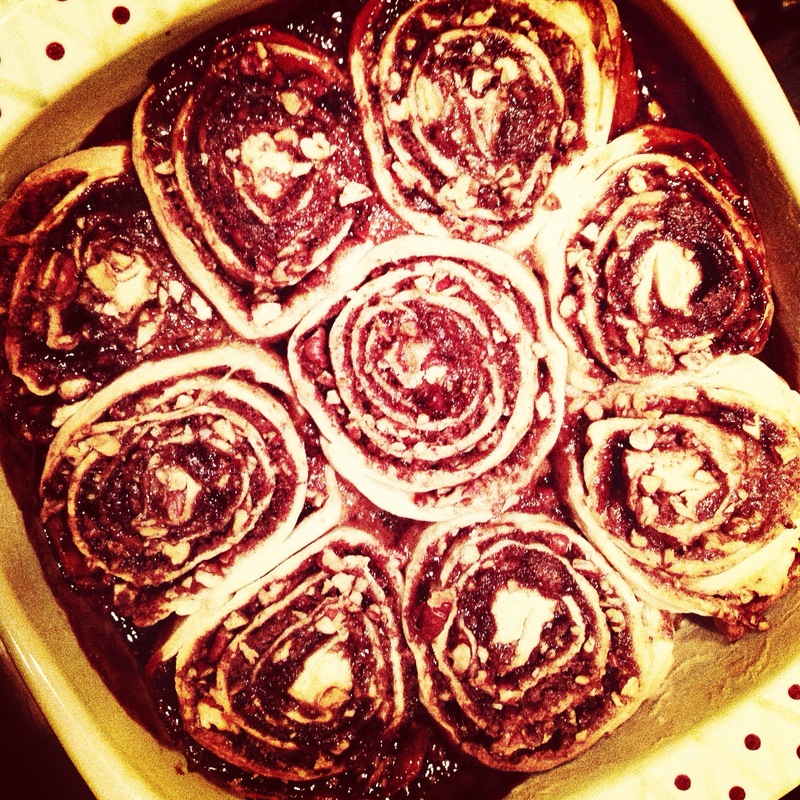 Take cinnamon rolls out of the oven and transfer entire pan to a cooling rack. Brush with melted butter and drizzle with icing. Allow rolls to cool long enough so they won’d burn the insides of your mouth, then devour as quickly as possible.